Edwin S. Lambert was born circa 1878 at Wisconsin. He was the son of Thomas Lambert and Caroline Miller. Edwin S. Lambert died before 1956. [S246] U.S. Federal Census 1880 U.S. Federal Census, by Ancestry.com, NA Film Number T9-1426 Page Number 426C. Morgan Orlando Loomis was born on 19 June 1863 at Cooperstown, Otsego, New York. He was the son of Orlando G. Loomis and Hulda O. Robinson. Morgan Orlando Loomis married Clara Augusta Steen on 20 February 1886. Morgan Orlando Loomis died on 11 August 1926 at Mauston, Juneau, Wisconsin, at age 63 Died from a fall from a wagon while asisting police in caring for a man found intoxicated. He came to WI when six months old. Lived on a farm in Lindina until 1895, when he became deputpy sheriff under Sheriff Tarbox, and after Tarbox resignation and his father becoming sheriff, he became Undersheriff. He was under sheriff or sheriff at various times untill 1926 for a total of some 20 years. Director of Juneau County State Bank, President of Mauston Mercantil Co.
[S246] U.S. Federal Census 1880 U.S. Federal Census, by Ancestry.com, NA Film Number T9-1430 Page Number 403A. Married Name 20 February 1886 As of 20 February 1886,her married name was Loomis. Clara Augusta Steen was born on 1 March 1867 at Mauston, Juneau, Wisconsin. She married Morgan Orlando Loomis, son of Orlando G. Loomis and Hulda O. Robinson, on 20 February 1886. Clara Augusta Steen died on 23 November 1923 at Mauston, Juneau, Wisconsin, at age 56. Clara Augusta Steen had 4 with 4 living in 1900 children. She had 5 with 4 living in 1910 children. Joseph Sherwood Sr. was born on 21 June 1835 at Onondaga, Onondaga, New York. He was the son of Daniel Sherwood and Diantha Dyer. Joseph Sherwood Sr. married Alice Ann Safford, daughter of Robert Gerrish Safford and Louisa Boston, on 3 July 1858 at Jackson, Wisconsin. Joseph Sherwood Sr. married Anges Taylor on 10 November 1896 at Trempealeau, Wisconsin. Joseph Sherwood Sr. died on 10 February 1904 at Wisconsin at age 68 also reported as Winona, Minnesota. He was buried after 10 February 1904 at Dunn-Safford-Sherwood Cemetery, Taylor (also reported as Springfield), Jackson, Wisconsin. [S248] U.S. Federal Census 1860 U.S. Federal Census, by Ancestry.com, Page 80. Dwelling 679. [S246] U.S. Federal Census 1880 U.S. Federal Census, by Ancestry.com, NA Film Number T9-1429 Page Number 373D. [S245] U.S. Federal Census 1900 U.S. Federal Census, by Ancestry.com, ED133. Dwelling 123. Name Variation Alice Ann Safford was also known as Ellis. Married Name 3 July 1858 As of 3 July 1858,her married name was Sherwood. Alice Ann Safford was born on 16 February 1841 at Maine. Alice Ann Safford married Joseph Sherwood Sr., son of Daniel Sherwood and Diantha Dyer, on 3 July 1858 at Jackson, Wisconsin. Alice Ann Safford died on 3 January 1894 at Springfield, Jackson, Wisconsin, at age 52. Children of Alice Ann Safford and Joseph Sherwood Sr.
Name Variation Jessie V. Sherwood was also known as Jesse. Married Name circa 1885 As of circa 1885,her married name was Schroeder. Jessie V. Sherwood was born on 3 June 1864 at Wisconsin also reported as 3 Jun 1865. She was the daughter of Joseph Sherwood Sr. and Alice Ann Safford. Jessie V. Sherwood married Henry F. Schroeder circa 1885. Jessie V. Sherwood died on 12 May 1940 at Los Angeles, California, at age 75. Jessie V. Sherwood had 3 with 3 living in 1900 children. She had 3 with 3 living in 1910 children. Name Variation Frankie Corrine Sherwood was also known as Alice F.
Frankie Corrine Sherwood was born on 25 January 1868 at Wisconsin. Frankie Corrine Sherwood died on 7 January 1884 at Springfield, Jackson, Wisconsin, at age 15. Married Name 2 January 1893 As of 2 January 1893,her married name was Bowen. Effie Pearl Sherwood was born on 10 July 1875 at Springfield, Wisconsin, also reported as Jul 1874. Effie Pearl Sherwood married Albert John Bowen, son of (?) Bowen and (?) Peck, on 2 January 1893. Effie Pearl Sherwood had 1 with 1 living in 1900 children. She had 2 with 2 living in 1910 children. [S250] U.S. Federal Census 1930 U.S. Federal Census, by Ancestry.com, ED723. Dwelling 326. John Worden Welch married Katharine A. Imholt, daughter of Henry Imholt and Frances M. Huelscher. John Worden Welch was born on 20 January 1893 at Minnesota. He was the son of Maurice Welch and Julia Thompson. John Worden Welch died on 25 December 1940 at age 47. Name Variation Elenor Catherine Welch was also known as Nora. Married Name 23 February 1918 As of 23 February 1918,her married name was Marsch. Elenor Catherine Welch was born on 6 September 1894 at Minnesota. Elenor Catherine Welch married Paul Marsch on 23 February 1918 at Washington. 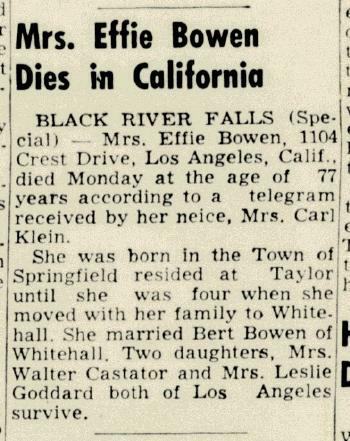 Elenor Catherine Welch died on 27 January 1978 at Alaska at age 83. Name Variation Thomas Ruggles Welch was also known as Ruggles. Thomas Ruggles Welch was born on 13 August 1896 at Minnesota. Thomas Ruggles Welch died on 26 September 1971 at age 75. Thomas Ruggles Welch obtained US Social Security Card at Alaska; last residence Oregon City, Clackamas, Oregon. Married Name 7 November 1916 As of 7 November 1916,her married name was Imholt. Mary Annette Welch was born on 8 April 1898 at Yellow Medicine, Minnesota. Mary Annette Welch married Aloysious Christopher Imholt, son of Henry Imholt and Frances M. Huelscher, on 7 November 1916 at St. Leo, Yellow Medicine, Minnesota. Mary Annette Welch died on 24 October 1978 at age 80. Name Variation Patrick Miles Welch was also known as Miles Patrick. Patrick Miles Welch was born on 4 March 1900 at Minnesota also reported as 14 Mar 1900. Patrick Miles Welch died on 11 November 1966 at age 66. Patrick Miles Welch obtained US Social Security Card at New York; last residence Oregon City, Clackamas, Oregon. Hazel R. Welch was born on 29 October 1906 at Minnesota. Hazel R. Welch died on 28 July 1907. Joseph M. Welch was born on 12 April 1913 at Minnesota. Joseph M. Welch died on 7 December 1914 at age 1. Married Name 7 February 1884 As of 7 February 1884,her married name was Welch. Sally J. Donnelly was born on 25 September 1856. She married Maurice Welch, son of John Welch and Mary Ann O'Brien, on 7 February 1884 at Philadelphia, Pennslyvania. Sally J. Donnelly died before March 1892. Joseph Patrick Welch was born on 17 November 1885. He was the son of Maurice Welch and Sally J. Donnelly. Joseph Patrick Welch died on 1 December 1885. Charles Maurice Welch was born on 8 September 1886. Charles Maurice Welch died on 8 December 1886. Name Variation Ira Joseph Wheeler was also known as Ira W.
Ira Joseph Wheeler was born on 18 December 1892 at Wisconsin. He was the son of Upton G. Wheeler and Leonore F. Shrouds. Ira Joseph Wheeler married Grace Ursula Dorow, daughter of Henry Dorow and Lottie A. Merriman, in 1919. Ira Joseph Wheeler died in February 1979 at age 86. Ira Joseph Wheeler obtained US Social Security Card at Wisconsin; last residence Wisconsin Dells, Columbia, Wisconsin; last benefits Reedsburg, Sauk, Wisconsin. On 5 June 1917 at World War I Draft Registration, Sauk, Wisconsin. [S245] U.S. Federal Census 1900 U.S. Federal Census, by Ancestry.com, ED138. Dwelling 222. Hattie Hewitt was born on 15 October 1879 at Baraboo, Sauk, Wisconsin. She was the daughter of Arthur Hewitt and Ethley M. (?). Hattie Hewitt died on 23 February 1948 at Baraboo, Sauk, Wisconsin, at age 68. Hattie Hewitt had zero children. [S358] Wisconsin Pre-1907 Vital Records (published), Marriage Record ID: 2358383. [S244] U.S. Federal Census 1910 U.S. Federal Census, by Ancestry.com, ED114. Dwelling 19. [S243] U.S. Federal Census 1920 U.S. Federal Census, by Ancestry.com, ED163. Dwelling 73. Name Variation Jeremiah Bailey was also known as Jerry. Jeremiah Bailey was born in 1835 at Millcreek, Erie, Pennsylvania. He was the son of Hiram George Bailey and Mary Polley Eldredge. Name Variation Hester Matilda Bailey was also known as Tillie. Hester Matilda Bailey was born on 9 January 1837 at Millcreek, Erie, Pennsylvania. She was the daughter of Hiram George Bailey and Mary Polley Eldredge. Sarah Janette Bailey was born in February 1840 at Millcreek, Erie, Pennsylvania. Zoeth E. Bailey was born on 16 August 1844 at Millcreek, Erie, Pennsylvania. Zoeth E. Bailey died before 21 October 1887. Zoeth E. Bailey was MLT PENSION on 21 October 1887. [S248] U.S. Federal Census 1860 U.S. Federal Census, by Ancestry.com, Page 199. Dwelling 1679. George Hiram Bailey was born on 15 October 1846 at Sumpter, Sauk, Wisconsin. Lettie Bailey was born circa 1857 at Wisconsin. Lindley Bailey was born circa 1859 at Wisconsin. Married Name Her married name was Eldredge. Mary Polley married (?) Eldredge. Mary Polley was born circa 1790 at Pennsylvania. [S247] U.S. Federal Census 1870 U.S. Federal Census, by Ancestry.com, Dwelling 56. (?) Eldredge married Mary Polley. Married Name 6 September 1899 As of 6 September 1899,her married name was Lyster. Lettie Doney was born in September 1876 at Wisconsin. She married Albert N. Lyster, son of Franklin Jean Lyster and Hannah Nehimire, on 6 September 1899 at Grant, Wisconsin.